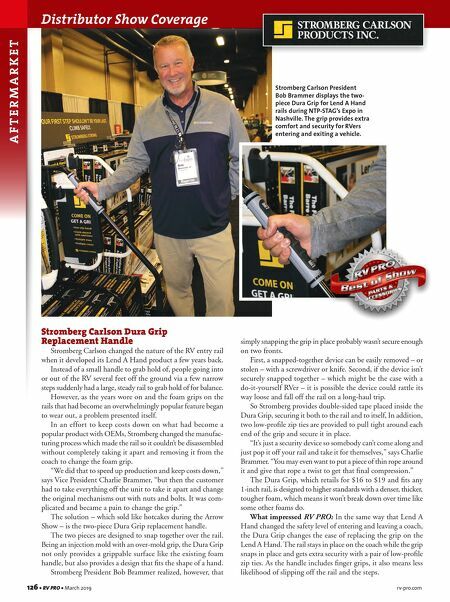 rv-pro.com March 2019 • RV PRO • 127 rv-pro.com March 2019 • RV PRO • 127 Furrion Chill Air Conditioner Rarely do you see that kid-in-a-candy-shop moment at a distribution trade show – unless your name is Furrion. At the Keller Marine & RV show in Pennsylvania, one RV technician giddily cried out when he saw the latest rooftop air conditioner. He bragged to a fellow technician about being able to run two ACs on 30 amps as he pulled him over to Furrion's booth. The Furrion Chill is set to debut shortly, and it's already drawing positive attention. The aerodynamic unit (which comes in 14.5- or 15.5-amp options and is available in two color options: black or white) is engineered with dual-fan technology and weighs about 80 pounds. "It's about 25 pounds lighter than others," says Joe Wood, sales manager for Furrion's RV aftermarket. "The construction itself is very interesting." The top and bottom pan of the rooftop AC unit is made of a thermoplastic polymer – a hard composite, unlike other AC units. "Your older pans in the past would corrode, rust, and would be sharp on the edges. Sometimes you accidentally end up cut- ting the rubber roof trying to install a new unit," Wood says. "Some of the technicians found that very important." Both unit options range from 60 to 86 degrees Fahrenheit and have an outdoor sound pressure level of 80 decibels. The air conditioners can fit for ducted or non-ducted cooling systems. The detachable filter can be cleaned and replaced easily with both units using an LG compressor. The Furrion Chill comes with a two-year warranty, and is available for the aftermarket as well as original equipment. (The product will be appearing in Airstream models, among others.) Other product features/ accessories include an air distribution box with LED lights that change color to fit the mood, and a programmatic wall thermostat that can control different zones. "The interesting part, in my opinion, about the 14.5 unit is you can run two off of a 30-amp service. That's pretty big in the industry," Wood says. "It's always been known that 30-amp is only really going to service one unit because of the amperage draw on the older ACs. So, when our 14.5 kicks on, it's only going to kick up about a 14.4 draw. It's going to go back down to around 8 or 10 (amps) depending on where (RVers) are at in the country … so now you got two running on 30-amp service." 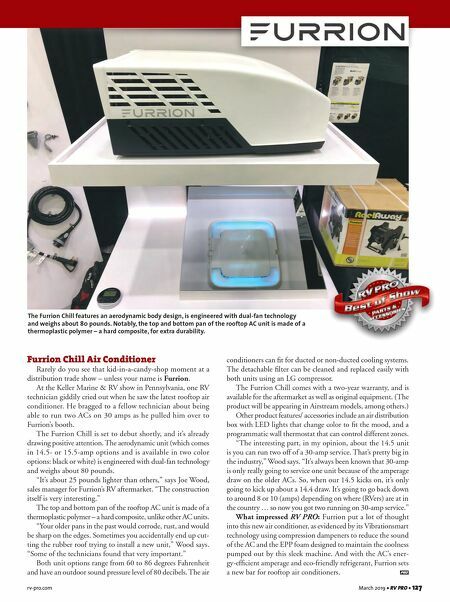 What impressed RV PRO: Furrion put a lot of thought into this new air conditioner, as evidenced by its Vibrationsmart technology using compression dampeners to reduce the sound of the AC and the EPP foam designed to maintain the coolness pumped out by this sleek machine. And with the AC's ener- gy-efficient amperage and eco-friendly refrigerant, Furrion sets a new bar for rooftop air conditioners. The Furrion Chill features an aerodynamic body design, is engineered with dual-fan technology and weighs about 80 pounds. Notably, the top and bottom pan of the rooftop AC unit is made of a thermoplastic polymer – a hard composite, for extra durability.